Designed for grades 4 & 5, All That Jazz is a curriculum-based program featuring standard jazz repertoire to create an environment where everyone can listen, learn and play. Come join the Columbus Jazz Orchestra in a live performance of standard jazz repertoire at the historic Southern Theatre located in downtown Columbus. 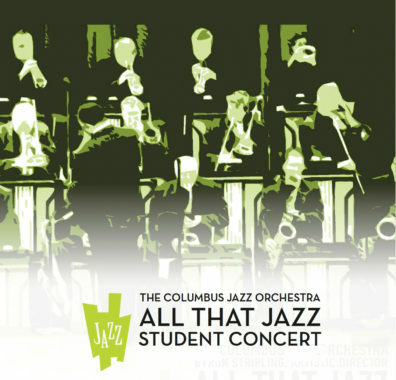 All That Jazz offers youngsters from all backgrounds the opportunity to hear the powerful sound of America’s big bands. Students discover jazz, its origin and development throughout American history, through a curriculum developed by central Ohio’s premier children’s jazz educator, Becky Ogden. Each student receives his/her own book to prepare them for the performance. Lessons include: Improvisation, Big Band Instruments, 12-Bar Blues, Jazz Time Line, Jazz Vocabulary, Jazz Geography, 32-Bar Song Form, Musicians Biographies and much more. During this interactive Columbus Jazz Orchestra concert, students will demonstrate their knowledge of a 12-bar blues, sing “Route 66” and experience the excitement of the band. Tickets are $6 per person. Price includes an All That Jazz study guide for each student and “Teacher Notes” accompanied by audio recordings for educators to prepare students for the CJO performance.